from Jazz-Rock Partita for Bayan solo in four movements. Video demo: Borys Myronchuk. Amorosamente - Part 3 from Jazz-Rock Partita for Bayan solo in four movements. Video demo: Borys Myronchuk. 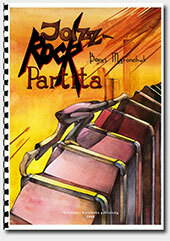 Jazz-Rock Partita for Bayan solo in four movements. Video demo: Borys Myronchuk. Jazz-Rock Partita, part 1. Video demo: Borys Myronchuk. Jazz-Rock Partita, part 2. Video demo: Borys Myronchuk. Jazz-Rock Partita, part 3. Video demo: Borys Myronchuk. Jazz-Rock Partita, part 4. Sonata for Bayan Borys Myronchuk.